Americans who want immigration numbers reduced are in the majority, and they are being largely ignored by immigration policy negotiators in the U.S. House. That's the chief point of NumbersUSA's widespread advertising campaign that began around Christmas and has accelerated in June. We are running full-age ads (like the one to the left) in national, D.C. and New York newspapers that are read by policy makers. The facts in the ad are backed by dozens of state and national polls, as well as government data. I'll share the sources in this blog. Most voters in the majority don't realize they are. We want them to have the confidence of knowing that their fellow Americans agree with them by overwhelming margins on the question of reducing immigration. And we want elected officials to pay attention to the fact that likely voters in this fall's midterm elections support deep cuts in the numbers by higher than a 3-to-1 margin. A lower section of the ad shows results from an April 4 national survey of 1,000 likely midterm voters taken by The Polling Company. The margin of error was a small 3.1 percentage points. The sample size was Democrats (35%), Republicans (30%), Independents (35%); female (53%), male (47%); 18-44 (36%), 45-64 (39%), 65+ (25%). Current federal policy adds about one million new immigrants with lifetime work permits into the U.S. each year. Knowing this, which is closest to the number of new immigrants the government should be adding each year.?" to "250,000 or less" (49%). doubling it to "two or more million" (7%). The data on the bar about Hispanic opinion did not come from the survey above but from a separate national survey conducted on the same day (April 4) by The Polling Company "among 498 Hispanic and Latino likely voters," with a margin of error of 4.39 percentage points. "Sample frame was weighted to match Census, election, and voter registration statistics of likely Hispanic and Latino voters by age , gender and political affiliation nationwide." The sample size was Democrats (37%), Republicans (22%), Independents (40%); female (50%), male (50%); 18-44 (38%), 45-64 (41%), 65+ (21%). 46% chose cutting from one million a year to "250,000 or less"
10% chose doubling to "two or more million"
The reason immigration has been such a big issue for the last 25-30 years is that the annual numbers of legal immigrants getting lifetime work permits each year has grown from 250,000 in the 1950s to nearly a million per year in the 1990s and rising above ever since. 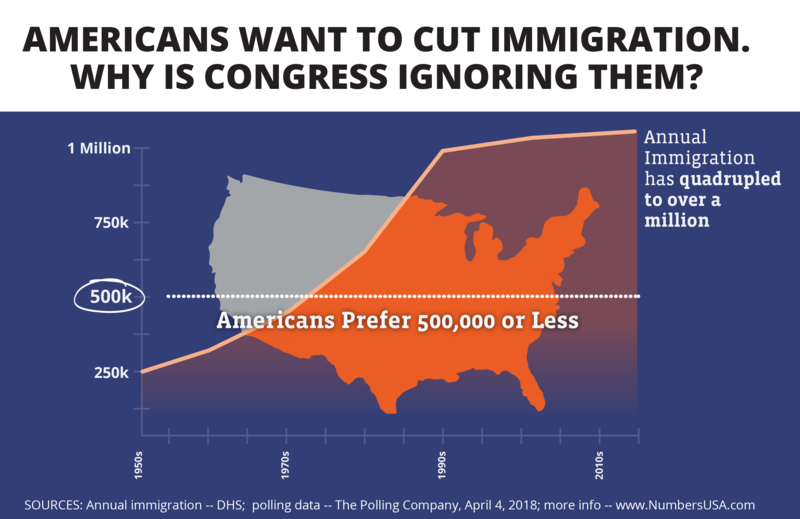 The April national polling noted above found that the majority of likely voters want to cut immigration to 500,000 or less (with most of them preferring 250,000 or less). You can check our polls page to see how these kinds of cuts are popular in many states (including California) in all regions. So, why are some in Congress considering changing immigration policy without reducing the numbers? 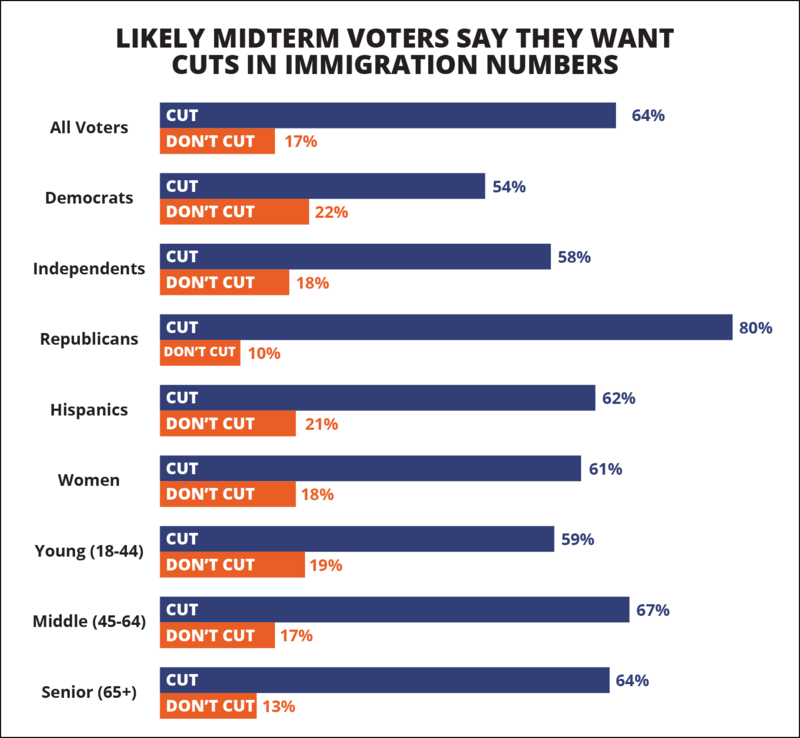 If immigration numbers aren't cut, voters might make some cuts of their own in November."